Meaning: Sadhus are always engaged in making progress towards the discovery of truth. It is my duty to protect them (paritranaya) and destroy (vinashaya) those who are engaged in the pursuit of wickedness and evil (dushkritam). I will repeatedly return in each and every yuga or age (yuge yuge), whenever necessary and feasible (sambhavami), to re-establish (sansthapana) the rule of Dharma for future generations. 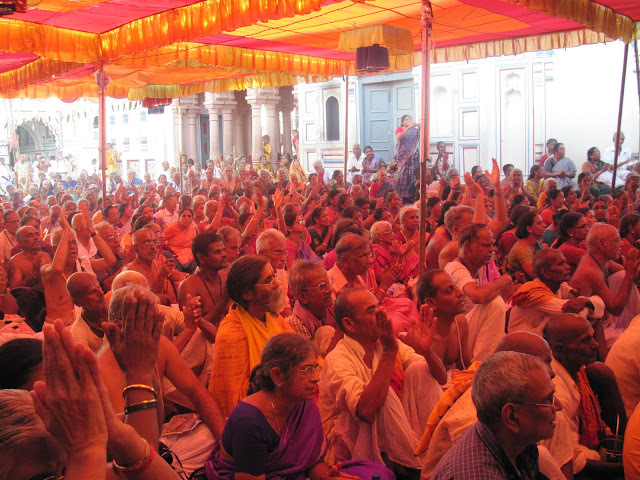 The above verse tells us the purpose of various Avatarams (incarnation) of Perumal. For the up-liftment of the good and virtuous. For the destruction of evil. For the re-establishment of the natural law, Perumal takes different avatarams as in the following verse. pinnum iraamanaai dhaamodharanaai karkiyum aanaan"
Mahalakshmi Devi appears in different forms, corresponding to the forms of Lord Vishnu. He takes different forms and comes down for the destruction of evil. Lord Rama always attempts to save us, but we tend to do many mistakes along with good deeds in our life. Even if Rama decides to take care of us, the papa (bad deeds) done by us becomes a great hindrance. Which leads to the anger of Perumal and Piratti (Lakshmi) comes in between to help us. Lakshmi talks on behalf of us to Peruman and helps us in relieving our papam and helps us to join the paramatma. If She is not along with Him, He punishes us. If She is around, He showers loads of blessings. Hence in all the temple we visit Thayar Sannadhi first and then we visit Perumal Sannadhi. In our previous article, we saw the birthplace of Sita Devi, Sitamarhi near Dharbhanga district of Bihar. We are leaving Sitamarhi and heading towards our next destination. We all saw the birthplace of Sita Devi, but When did Sita Devi born? We all celebrate the birthday of Lord Rama on Rama Navami. Lord Rama was born on Navami Tithi during Shukla Paksha of Chaitra month in Punarvasu nakshatra. Likewise we don't have Sita Jayanthi, is it only Rama Jayanthi? In south, we don't give much importance to Sita Jayanthi, but in Sitamarhi, Janakapuri and other northern parts of India it is celebrated with full glory as Sita Jayanthi/Janaki Jayanthi. Sita Devi was also born on Navami Tithi during Shukla Paksha of Vaishakha month in Pushya Nakshatra. In coming days, let us also celebrate Sita Jayanthi in southern parts of India also. Now we are reaching towards the border of Nepal. Do we require Visa or Passport to cross the border? No, it is not required. We need to carry any Identity Card like Voter's ID to prove the identity of Indian citizenship. The security personnel their, notes down the details of the respective members and gives the permission to cross the border. This is an good initiative made between India and Nepal government. We have different places for border crossing from India to Nepal. 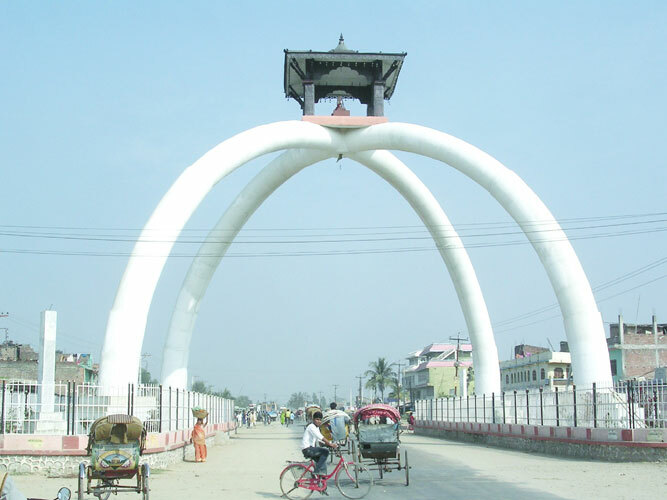 One such border crossing is known as Sunauli. Sunauli is the traditional name given to both sides of this India/Nepal border crossing, 70 kilometers north of Gorakpur and 3 kilometers south of Bhairahawa. Bhittamod is another border crossing between India and Nepal. The distance from Sitamarhi to Janakapuri is 50 KMs. In between we get a place known as Bhittamod, where the border security check is done. After the security check, we entered Nepal. Mentally everyone were relieved since there were many doubts on whether there will be problem in crossing the border. The language spoken here is Maithili. Janakapuri was earlier called Dheera Bhukthi and later over period it changed and came to be known as Thiruhoot. We have entered the city of Janakpur, historically called Mithilanchal Dham. aiyanai "ollai va" enru azaippadhu ponradhu amma"
Meaning: The flags of the fort of Mithila fluttering, looked like hands waving and saying that Sridevi has come to reside there leaving her abode of lotus due to the penance done by the land and its people and as though calling Rama to come there to claim her hand. The celestial wedding (Tiru-Kalyanam) of Sita and Rama is observed in Panguni month (March-April) when Nakshatra Uthiram or Uttara Phalguni prevails. 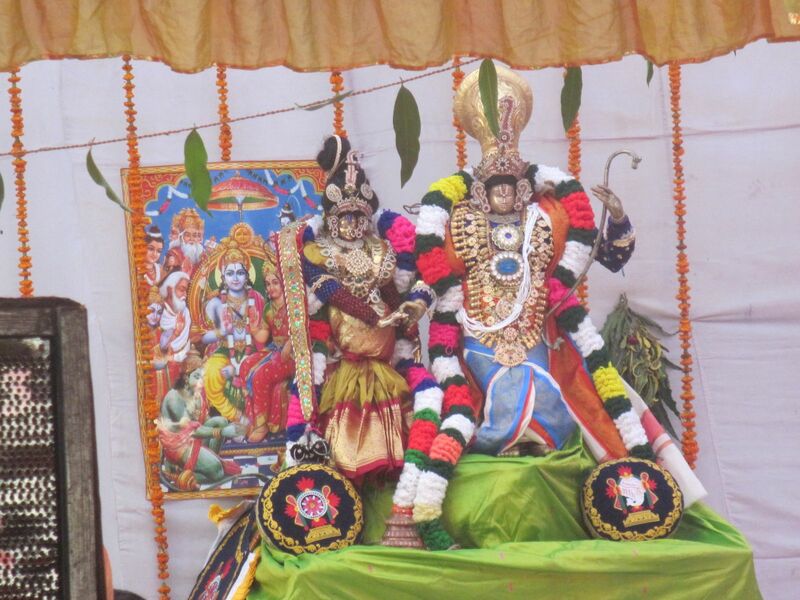 In South, the wedding of Rama and Sita is celebrated on Panguni Uthiram. In most of the temples, Serthi Utsavam (the divine union of the Lord with His divine Consort) is celebrated on the day of Panguni Uthiram. 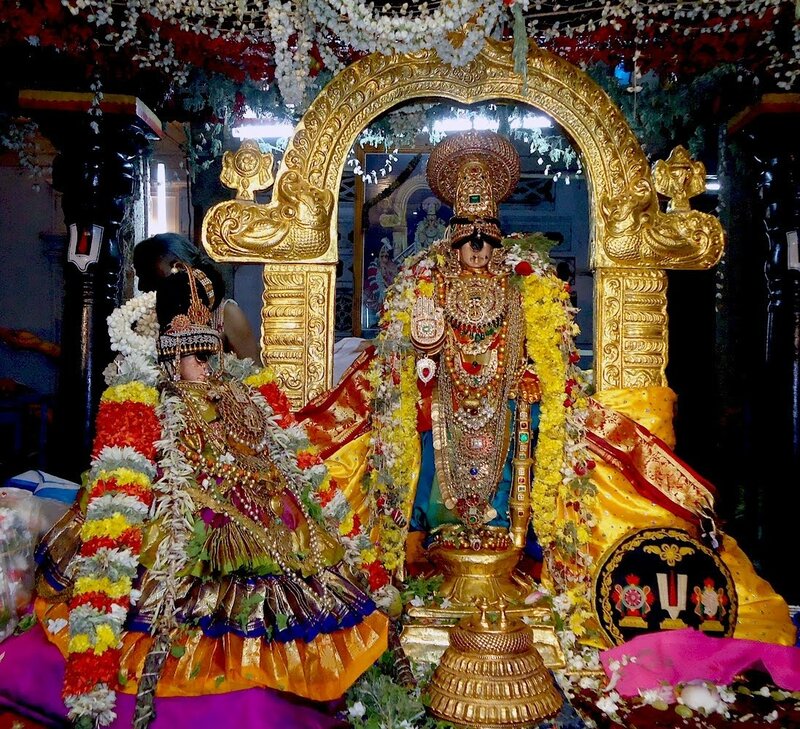 Of the numerous rituals, festivals and functions at the Srirangam temple, the Ranganathar-Thayar (Namperumal as Lord Rama and Thayar as Sita) Serthi utsavam on the Panguni Uttram day assumes awesome importance as that is the only day when the divinities remain side-by-side to bless the devout. In Mithilanchal region (Janakpuri) and North India, the marriage of Rama and Sita is celebrated as Vivah Panchami. It is observed on the fifth day of the Shukla paksha or waxing phase of moon in the Margashirsha month (November – December) as per Hindu calendar. Now Let us all watch Sita Kalyanam, we don't have enough knowledge, bhakthi to wish this couple Ram/Sita but we have lots of affection towards them. Due to the affection towards Ram/Sita let us sing "Pallandu Pallandu" for this couple. Marriage comes with lots of fun and chaos too. We also had lots of chaos during our travel. Plan was to start at 9 and reach by 11, so that we can finish the Sita Kalyanam by 3 PM, so that after the Kalyana food, we could start at 5 PM in order to avoid the night travel which had security issues. But we ended up starting at 10 PM in the night. After Kalyanam Thirumangalya Dharanam, Sapthapathi, Bajan's and wedding food we started from there.